Right or wrong, sad or not emotions are triggered from feelings of past. Meaningless chatter connecting the dots, leads to an abyss of the days of past. Happiness recedes like the waves that dance upon the shore, fleeting away… now your balance is gone. Joy retreats as sadness comes forth, beginning the play of memory recall. Some truth, some not, forgotten fragments of days of past. One trigger, one word, one moment in time and in instant your thrown backwards in time. Years of past forgotten pain awaken in your body, it’s as if they’ve been reborn. Shmego that fear guy comes in twisting your views. What you do now depends on you. Listen to the mind chatter of those past stories ? Can you see yourself rather surrounded by love ? Letting them go, one by one. Hold still my dear, don’t fear, this too shall pass. They were only your worries of days of past. The moment just passed. Be still in this moment and your calm will last. Choosing to surrender the those memories of old. Healing the thoughts will make you whole. Forgiving the past time and again remembering Love’s promise “I’ve got your back”. The road seems long unending at times. Your old wounds haunting you as days go by. Keep your focus on God your faith will renew and the chains that once bound you no longer do. Love over fear, your choice will be clear. Dear One healing is here. An empath can read others emotions, immediately understanding how they are feeling and understanding that person’s energy. Being surrounded by others can be great, until your senses are heightened and all you want to do is curl up in bed with a book. Or if you simply skip the party and stay in bed with your book no matter what. A dog came up to you? Cry. When your conversations with your animals are better than you’ve ever had with a person. When you drink a cup of coffee and it feels like you’re on crack, even if you have no idea what crack is. Do your crystals have their own windowsill? If you feel like you fell down the rabbit hole everytime you walk outside. Everyone must like you, and if they don’t it immediately affects how you view yourself. Everyone must be happy for you to be happy. A crowd of people? My head hurts. A bad aura? Stranger danger on a whole new level. Everything hurts, and you just want to cry. Screw deja vu I know exactly how tomorrow’s going to go. I know how difficult it can be to navigate your day as an empath, that is why I created a site full of resources and tools to help you live your best life! Decoding the Empath: Clairempathy: Known also as an Empath, this is the gift of clear knowing and emotion. Your senses, intuition, emotions and feeling are heightened. With the gift of being an Empath you will have one or more heightened senses. It is through these heightened senses that the energy will flow inside your body and you will experience physically what the other person is experiencing. An Empath has a physical connection to others on an internal level. All empaths are also sensitive souls. When the gift of clairempathy is off balance, you will experience heightened emotions, manipulation, uncontrollable mood swings, and may even experience depression and/or anxiety. I would love to hear how your sensitive side challenges you… leave your comment or questions in the comment section! I hope this information shines some light on how you can manage your energy. If you know someone who could use the information caring is sharing! Have you lost sight of who you are and what makes you unique? Let me take you back in time, to the mid 80’s, I was a 20-year-old gal who was newly married and had just given my birth to my first baby. 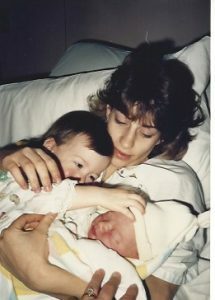 This is me in 1987 just after giving birth to our second baby! I would spend hours upon hours rocking, walking, and swaddling my newborn very colicky baby girl… well into the wee hours of the morning. I’m sure that you have similar memories and have also searched for answers to calm your stress, fears and worries. My search came out of pure desperation for some sleep I began reading self-help books focusing on parenting. By the time my second baby was born I had a trusted library filled with advice and how to’s. This was a personal sacred place where I found peace and comfort from knowing the authors of these books were my personal advisors the best part was that they were close by and within my reach. One book in particular during this time became my young mama handbook, “Baby and Child Care” by Dr. Spock. I felt an immense sense of relief when I would find the answers to my questions within the pages. I not only admired Dr Spock and his teachings I also respected the collection of guidance and support from the books that found their way into my library. Each one helped me to gain confidence and clarity. What I now know is that these books came as a pathway to illuminate my journey as a mother, a wife and into becoming an author. God is always guiding each of us in a loving and gentle way. Over the years my guru list grew and changed and how I connected to them also shifted. Today we have instant access and a simple click on our key pad that connects us to the knowledge we desire. The problem with this instant connection is we become overloaded with information that isn’t necessarily meant for our personal growth. God has provided us with free will, it is through our choices we either move in alignment with what’s best for our personal well-being or we get stuck following a system, a method or advice that does not align to our souls journey. Have you ever been overwhelmed by all the white noise coming at you? I can say that I have totally fallen into this energy and I call it the guru trap. The guru trap is where we get a valuable tip or connection to an energy we feel our life may be lacking. Once we align with this energy, we are off and running with our new found guru. Identifying with their story leads us to wanting to shift and change our life, which is not the bad part. The problem begins when we invite into our life someone else’s method, ideals or dreams as our own. That is when you not in aliment with your Goddess truths. Who have you felt a connection to as your “guru”? For me, when I was not in alignment with my Goddess self, I was wanting and trying merge with energies that were not meant for me. What happened to me is what happens to all of us who get lost in the flow of others energy and are left feeling really crappy and unsupported by God. The unsupported we feel is an illusion. The Angels tell me that once we are deceived by this lower form of energy it creates the feelings of lack. It is from a lack point of view that your daily thoughts of having or being less then are rampant. This is energy that forms a barrier or block in your life that prevents love from being seen and felt. By staying in the flow of this energy you end up disconnecting from the flow of Divine love energy that is actually meant for you! How can you begin to identify with the love God is sharing with you is by becoming fully aware of your intuition. This may seem simple, but it is actually one of the most challenging things I see my clients struggle with. Over the years of sharing messages and Spirits guidance the one stand out life changing tone that comes forward from Heaven is the need for you care for yourself and to love you! You don’t need another quick fix, self help book or someone else’s methods to feel good, you need to love you, and to trust your intuition. 1. Surrender. Let go of control of what you believe you need and let love lead you to true abundance. 2. Gratitude. Remembering what you do have is far more rewarding and productive than thinking of the lack. 3. Love. Love you first, the rest will fall into place. Maybe your ready for change but aren’t sue of how to go about i? If you are ready to experience your greatness and heal what is no longer serving you I would love to have a conversations with you about the Transformational Session I offer… this would start with a complimentary 15 minute call. During your initial call I will answer your questions and share how the Transformational Session will connect your dreams to your goals while illuminating your beautiful authentic self. The best part is this is no strings attached call. If what I share with you does not resonate there is no obligation! To book your complimentary call … Click this link to sign up. Truth unveiling time… I almost threw the towel in on my dreams. Maybe you have felt like this too? As 2017 came to a close I was exhausted from the time and efforts that I’ve poured into building this unique spiritual business I was considering walking away from some aspects of it. I’ve come to the realization (with a little help from the Angels:) that to keep my dreams alive I have to take time to just be still. The guidance I received was something we can all take part in it is the tool of journaling! The Angels say to list your dreams and desires then list the things you are doing to reach them. What we are scattered in our thoughts and our day the goals we want to achieve seem so much further away then the actually are! *Shared thousands of messages from your loved ones and Divine guidance with you. *Written and published two books, The Goddess You & The Goddess Journal. *Created & wrote The Goddess oracle card deck. *Built three beautiful websites, jeannestreet.com, inspirithealingstudio.com & goddessyouniversity.com. *Created, written and taught workshops and classes. *Connected you to your loved ones on my weekly radio show Angels Don’t Lie. *Opened a healing studio in Woodbury Ct, Inspirit Healing Studio. *And… I am just about ready to submit my third manuscript to the editor, titled Angels Don’t Lie! Through all of this I have aligned with my Goddess truths with God through prayer and meditation to stay true to my life’s purpose and passion. Now that I am on the other side of the throwing the towel in I’ve found great comfort with the tools and guidance the Angels shared with me and that my friend this is what I aspire to help you to do as well, to be on the hopeful side rather than in the yuck! To align to your unique soul truths, follow your passions, live your dreams, connect with your desires and most importantly of all to heal the pains that enslave you to an existence of unsettledness. I’ll let you in on a little secret though, it’s not always been easy for me to know how to heal the blocks in my personal or in my business life. I’ve tried to follow other business owners methods, taken online courses and studied platform building with some leading peeps in the industry. Maybe you’ve also tried following others leads and have been left feeling frustrated or alone?! The answer came to me during a meditation where I was shown by Spirit that when it comes to building a Spiritually aligned life or business those “tested” & “proven” methods will not take root for everyone because they are not aligned with the truth of your personal Goddess path or within Gods Divine timing.You have to learn to decipher which ideas, and methods are meant for your life. This is where you have to be rocking your intuitive connection, to embrace or to let go! What I do know for sure is that we are each special and beautiful in our own light. I am definitely a different gal who’s work as Medium, Healer and Author requires times of rest, mediating and a clear mind set to follow the path and goals to be of service to God & others in a unique way. You are also a soul who needs rest and time away from all the chaos so you can have a clarity and calm to align to your intuitive self. Hey lets keep it real here, there are still times that I loose my balance and become weak in the knees when fear sneaks in. Yet it is also true that I am confident in the ability to re-align to my Goddess truths, all because of the beautiful Goddess principles the Angels shared with us! I don’t know if you have put any of the Goddess principles into practice in your life yet, but I wonder if you would for the sake of your well-being & for love? I want you to be inspired and awaken to YOUR Goddess truths and shine your beautiful soul-self outward with pure confidence! Flash back to 2007 when I started my first business, I had my moments of complete trust and of absolute fear. I worked really hard at all aspects of that business especially to build customer trust and a brand that stood for the values and morals that are important to me. What happens when you pour your heart and soul into something that doesn’t align with your soul purpose, you learn valuable lessons that propel you forward. I’ve learned through surrender that though we may see our actions as a mistake or a wrong doing it is really a magical moment for the soul to experience a miracle moment. I’ve had so many ah-ha miracle moments since choosing to close my first business, and shifting the focus to my authentic self. I learned that anything of value that comes to us, comes with a great soul healing as well. Closing my first business was painful, not because I felt like a failure but because I felt I was letting others down by doing so. I knew though with every ounce of me that I had to heal my wounds in order to live the truth of who I am now. Maybe you’re in one of those times that you are struggling with, and wonder if this is really where your supposed to be? Maybe you’ve had a desire to change jobs or open your own business but don’t have the faith in yourself to do so? Along my path from switching gears from one type of career to a completely different one, I have had to learn to manage some crazy energy and judgements from people who knew that old version of me. Part of your journey is to learn how to be uniquely you, and to do it within your family and the peeps that surround you. Not an easy thing when fear based thoughts and judgements comes at you from every angle. These 12 Goddess principles are nuggets of Divineness that came from a desire to not listen to the norm, to be the me I knew deep down inside that was fearfully hiding out. Through prayer and meditation the Angels spoke to me with a gentle guidance that helped me to heal fear and restore self-love. Who knew self love could be so difficult? I have found this challenge to be true for most of my clients and students. Knowing and seeing that others felt the same pain and separation from Divine truth that I felt, has brought me to a place of gratitude and of service. My entire life has been about helping others in some capacity or another. There's a purpose for each and every one of us Click To Tweet There’s a purpose for each and every one of us. I found that in being true to my soul-self and sharing my gifts is my “why” for creating Goddess Youniversity. The mission behind the Members Club is to help you SHINE and heal the things that block your beautiful light. This will not only be a place to learn and heal, your spirituality will also be magnified, while getting the support to help you keep growing.That’s not all… there are member extras, gatherings, Goddess socials and a fabulous gift package sent right to your door! This is everything you need to live in your true soul-alignment! You can get all of this for only$9.99 a month! I’ve made this offer so low and will close the door on December 1st, so that I and my team can give each Member time, energy and love while offering support and help they desire. Every month there will be brand new content added to the Members Club, making it an ever evolving and growing Youniversity! Your dreams and desires are worth every ounce of time and energy you put forth. Hey there, you the one who feels everything. The one who cries and doesn’t know why. The one who doesn’t understand what you feel so you hide behind that thing that actually makes you feel something within. The one afraid to go into large crowds. The one who gets overwhelmed at the grocery store. The one who feels scattered. The one is unsure of who you are. The one who picks up energy wherever you go … and I mean the good, bad and junkie energy from other people. You are the one I want to talk to, the one I want to share some amazing tools you can use to change how you feel right in this very moment! I have a gift of connecting to the Divine realm, AKA as being a Medium. I am also an Emapath and an HSP. Although being an Empath is similar to being a Highly Sensitive Person AKA HSP, there are a few distinct difference that tell these two gifts apart. So what the Angels have shown me in the many encounters I have had with other HSP and Empaths is how to decipher the energy of both these gifts. No matter if you are an Empath or an HSP it is important to learn how to work with your gift so you can function in the day-to-day life without the crash and burnout that comes with being you! You are an energy feeler so the more you understand about you and gather the right tools for living the easier it will be! And, when you slow down and pay attention to energy it can tell you a story of what’s going on around you. Why this is important is that when you are connected to energy in a healthy way, meaning through God, the energy can guide you. Now of course, there is more to energy and your gift than just these traits, but what I have come to see as the gateway to breaking down who you are is to understand where you stand within these top three traits. Understanding your gift is just the first step, next is how to clear and protect your energy and vital well being. 1. Prayer, surrounding yourself in God’s love everyday helps you to stay in your very own energy bubble and helps you to separate from energy you pick up. 2. Intention, setting a clear intention to stay in your energy field and within you body every day. 3. Mindful, being mindful of your thoughts they become your life. Keep them in tune with God! Now you have the tools and knowledge to understand not only your gift but also how energy can be your friend!